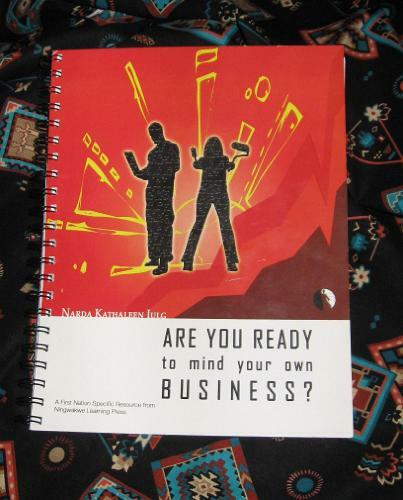 A new book, "Are You Ready to Mind Your Own Business," by Narda Julg and published by Ningwakwe Learning Press is now available. So you think you would like to start your own business? Whatever the reason you have for starting your own business, this workbook asks you questions that will help focus your thinking in the right direction. No one book or person can give you all the answers to your entrepreneurial goal. This manual is not your only source of information, but it is a great place to start. As soon as you begin to actually do the work required to fill in all the blanks, you will know just how much research is needed. When you are done working through this book, you will know what you are getting into and be prepared for almost anything the business world can throw at you. Author, Narda Kathaleen Iulg talks to you from her own experience. She gives you the real truth of what it was like for her. Tips are also provided on how you can overcome the problems along the way with focus and hard work. Though this book was written for the Aboriginal community the business advice can be used by anyone wishing to start their own business. "Are You Ready to Mind Your Own Business" is available from NKJ Native Originals for $29.95.